So, I’ve built the controller. The design was pretty simple. Using an ATTiny24A, I’d monitor the voltages of the battery and two power inputs, and code would decide which input to use, if any. It also could use the in-built temperature sensor to control cooling fans. This is the schematic I knocked up this morning. The values of most resistors are not critical. I found I needed 1kOhm resistors into the bases of the transistors as the MCU was not happy driving them directly. The transistors I’m using are BC547Bs controlling AUIRF4905 MOSFETs. 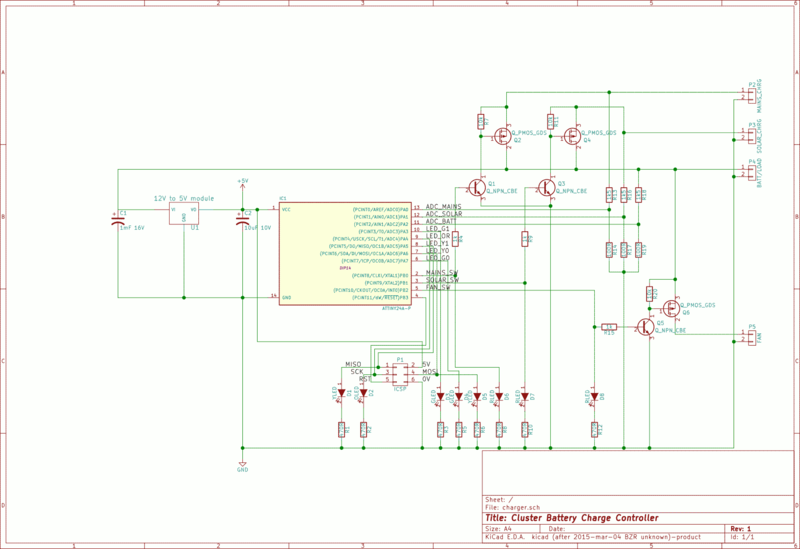 The only components that are critical are the voltage dividers on the ADC inputs. I’ll be using the built-in 1.1V reference in the MCU as that’s what’s needed for the temperature sensor anyway. This was a bit of an exercise in reviving old brain cells as it’s been some time since I’ve done a proper PCB myself. This is a one-off prototype with mostly larger components, so no point in getting boards fabricated. 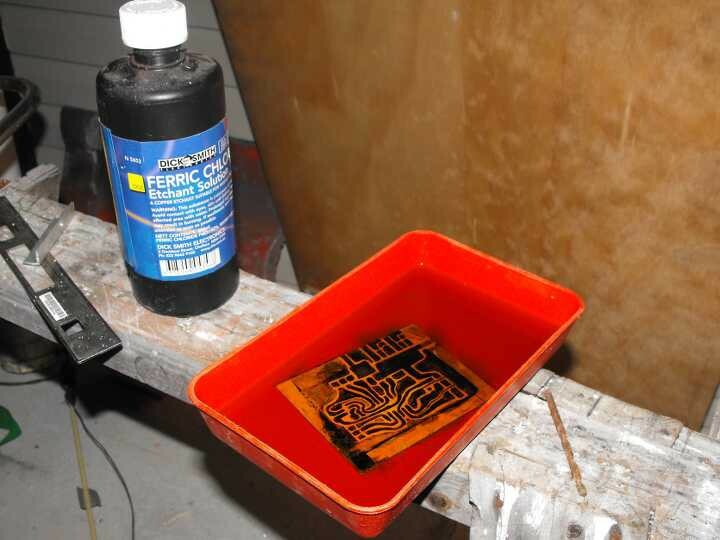 I did it the old fashioned way, using a dalo pen then etching in a bath of Ferric Chloride. That gives you an idea of what the board looked like prior to population. The underside was covered with tape to prevent it from being etched. It took a while, and I think I could have upped the concentration of the solution a bit, since it did leave some tracks un-etched. Perhaps my solution is getting a little old too… the logo on the bottle really dates it. I found I had to attack the gaps between some tracks with a knife since the etchant didn’t quite get it all. There are no tracks on the bottom, it’s just one piece of un-etched copper, to act as a ground plane. I guess the construction style is a cross between Manhattan and groundplane (dead-bug) construction. The constructed board looks like this. I’m not sure what all the LEDs will be doing at this point. Three share pins with the ICSP header, which means they flash as the board is being programmed… useful for troubleshooting ICSP issues. The IC socket is a cheap 14-pin one, I just bent the pins to mount it flush to the board. 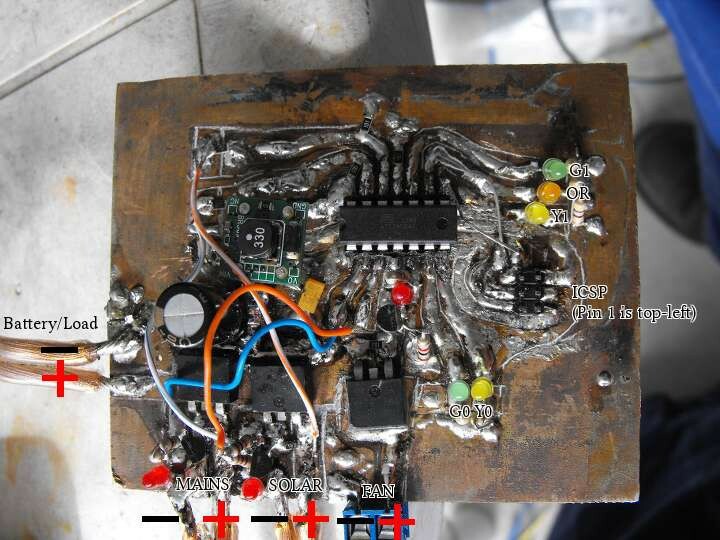 The 10uF tantalum on the output of the 5V PSU is possibly a 10V one. Where the electrolytic is, is where I had the 330uF tantalum mounted, and it went bang when I gave it 12V. That seems to prove the hardware is alive, and now I just have to get the software working. Now to try out the toolchain I built!